Cinema Experiences at the National Diving & Activity Centre, Chepstow. Welcome to the National Diving and Activity Centre's Cinema Experience. We have a wide range of films that you can watch from the comfort of your car in the Drive-In. Please see the listings on the right for upcoming screenings. Cinema bookings are available via our Cinema Booking Portal. Simply select which film you want to watch, enter your details and pay for your tickets. You will then receive a confirmation booking via email, this will be your ticket on the night. Please print this out and bring it along with you for the showing. If you can arrive 30 minutes before the showing that will allow you plenty of time to sit back, relax and pop into the cafe bar to stock up on cinema goodies before the showing. Once your booking has been confirmed we'll give you a food menu, the FM radio frequency for your car radio and you will be allocated a car parking bay. Then you can just kick back and enjoy the movie! Please note that if you are unable to turn off your car's lights when the radio is on, we request you bring along blankets or something else suitable to act as a blackout. This is to not ruin the viewing experience for others, and to keep the general area dark. After the movie there's no need to rush off, the View Cafe Bar with its stunning views is open until late. The View Cafe Bar serves a wide range of hot and cold meals as well as alcoholic and soft drinks, including tea and coffee. We also offer overnight accommodation in our Wooden Wigwam Village and have lots of other activities to enjoy, including Segways, our Wire Zip Slide and Water Walkers. 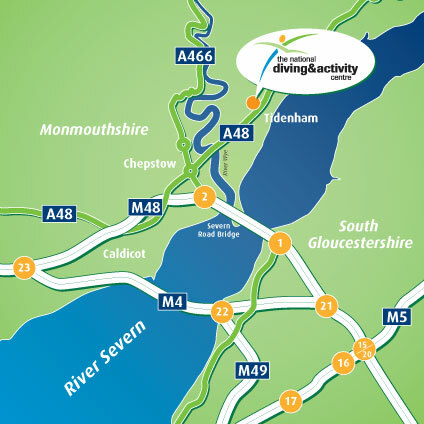 The NDAC Cinema Experience takes place at the National Diving & Activity Centre, Tidenham, Chepstow, Gloucestershire, NP16 7LH.